"Hah-ooh cinosrepus! 'Selbanev, Nosnikta, Senoj-Nitram,' said Jennings. 'They're the names of people, I bet you can't guess who!' 'Russian agents? - Zulu tribesmen? - Ancient kings of Egypt?' hazarded Darbishire. 'No, no, no,' Jennings flipped his fingers in delight and danced ungainly ballet steps round the tuck-boxes. 'Oh, wacko! If you can't guess, neither will anybody else, so we can use it for the code.'" When Jennings' new diary is made public, the thought of his most private thoughts being made public spur him to invent a secret language. Will anyone be able to decode it? And how does Jennings end up on the wrong side of the law? And what of the collection of ancient relics a visit to the Natural History Museum inspires Jennings and Darbishire to establish? Find answers to these and other questions, in this entertaining story by Anthony Buckeridge, narrated by the talented Simon Vance. 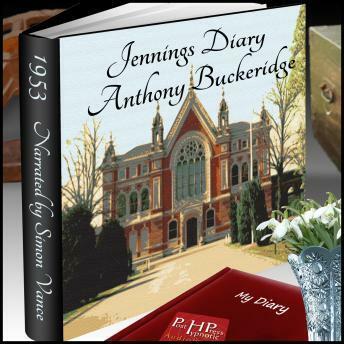 JENNINGS' DIARY is one of a series of 25 books by Anthony Buckeridge. The Jennings stories originated in a series of radio plays for the BBC's Children's Hour, which proved so popular they spawned this delightful series of books. The tales make liberal use of Buckeridge's inventive schoolboy slang ("fossilised fish hooks!," "crystallised cheesecakes!," and others). Published between 1950 and 1989, these books were favorites among a vast assortment of kids all over the world. JENNINGS GOES TO SCHOOL and JENNINGS AGAIN! were adapted for radio by Anthony Buckeridge and read by Stephen Fry, and Mark Williams (Aurthor Weasley in the Harry Potter films), recorded an abridged version of JENNINGS LITTLE HUT, all produced by the BBC. Loved by kids and adults alike, the Jennings books were translated into several languages and have sold over six million worldwide. Described as "Harry Potter without magic, but funnier," and "P.G. Wodehouse for kids," you'll want to check out the other titles in this series available from Post Hypnotic Press.